Dead End Derby Roller Girls present their first home exhibition bout for 2018, and it's an extra special one. Dead End Derby recently celebrated it's 10th Anniversary! Roller derby has changed so much in the last decade; and not just the rules and gameplay strategies..
Don't miss the action packed, full-contact, all-female roller derby battle between two awesome teams - Old School Derby vs New Derby. Doors open at 6.30pm and First whistle is at 7pm. Presale tickets will be available from https://www.eventfinda.co.nz/2018/dead-end-derby-exhibition-bout-10-year-anniversary/christchurch. Don't miss the FINAL All Stars home game of the season as they battle it out on the flat track against Northland's Hell's Wives! Get out your green and come along to witness this epic derby showdown! Pin-Ups vs Punks Exhibition Bout! It's 'skate fast, bruise pretty' at Cowles Stadium, Saturday 21st July in Dead End's latest exhibition bout! Whether you're naught or nice, dress up and scream for your team! It's North vs South with Auckland's Broadside Brawlers gearing up against your favourite dames, Christchurch's Living Dead Rollers! Be a part of the victory by dressing in green and screaming for your local league! Living Dead Rollers vs Derby Dames! It's green versus red in the first bout of the season with Christchurch knocking wheels against Timaru! See all the pummelling, pounding and pain at Cowles Stadium, March 11th from 6.30! Tickets available at eventfinda.co.nz or take your chances on the door! Check out Dead End's open scrimmage, 20th November at Cowles Stadium from 6pm! Featuring skaters from Christchurch Dead End Derby, Dunedin Derby, Timaru Derby and Pirate City! Gold coin entry. Doors open 5.30pm, first whistle at 6pm. It's the final boutdown for LDR this year! Can they conquer this last game to solidify their spot as New Zealand's best B team? Watch all the action from your favourite pew at Cowles, Saturday, 15th October! It's all go for Pokemon Whoa! Team Mystic is taking on Team Valor in this battle for derby supremacy! Back your team, wear your colours and come watch one side smash their way to victory! Fresh from their latest bout down in Dunedin in June, Christchurch's original Rollergirls Dead End Derby present fun for the whole family in this school holiday interleague bout: Dead End Derby All Stars (DED) vs Auckland Roller Derby League (ARDL). A brilliant school holiday Saturday night out for the whole family. 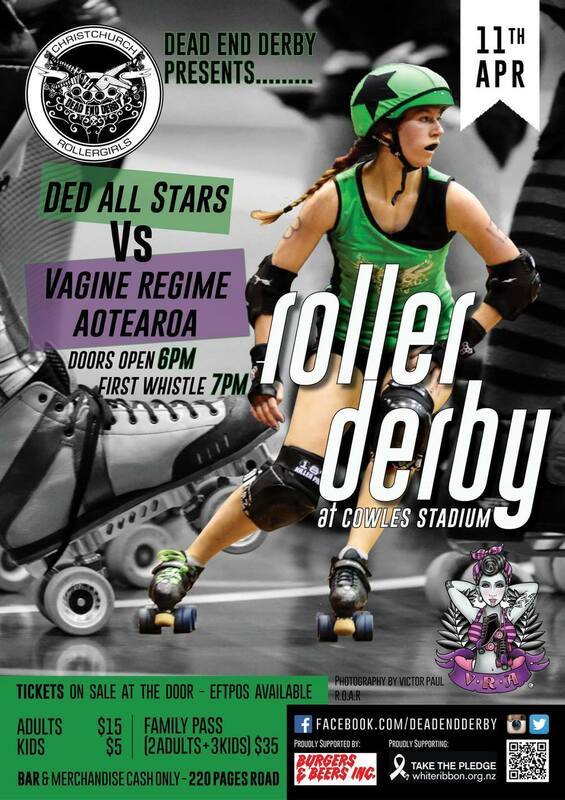 Come along dressed in green and black to support the DED All Stars. One of the world’s fastest growing sports, Roller Derby is a fast paced and played on an oval track. Five players on each team are on the track at a time for up to two minutes. Jammers, identified with a star on their helmets, try to pass the opposing teams blockers to score points for their team. Doors open 7:00pm, event starts at 7:30pm. Doorsales are available – cash or eftpos. · NO BYO food or drink, food vendors and licensed bar onsite. · DED Merchandise available for purchase. · Raffles and half-time entertainment. · No stiletto heels please. Join us for our season opener -Presale tickets available from Eventfinda here! ZOMBIE LOVER? VAMPIRES YOUR THING? Get your freak on this Halloween! Check out Dead End Derby Christchurch Rollergirls event page for all the info! Due to popular demand we are holding a second freshmeat intake in 2015 - this is our Learn to play Roller Derby course! This will be starting on October 10th, but it is important to register your interest prior to the intake so we can give you information about skates, gear and other league stuff! Email dedfreshmeat@gmail.com for more information. Note: You must be aged 18 by date of graduation (first half of 2016). Dead End Derby are proud to present our second to last home exhibition bout for our 2015 season on Saturday 26 September. We love dressing up and entertaining our fans and our themed bouts are always popular. Two equally matched teams will skate it out for the name of charity - we are proud to be supporting White Ribbon New Zealand during 2015 and a percentage of bout profits will go straight to them at the conclusion of our season. Tickets are just $15 each for adults at the door, but discounted tickets are available as pre-sales on Eventfinda.co.nz. Hot food available to purchase and a licensed bar on site with Derby specials. Doors opening at 6pm and first whistle at 7pm. Dead End Derby is proud to present the final public bout of 2015 which will be held on Halloween evening at Cowles Stadium, Christchurch. Please keep this date free in your diaries for our last bout of the year! Don't miss your chance to see Richter City Roller Derby league take on Dead End Derby Christchurch Rollergirls in a rare double header in Wellington! Help us fundraise at our upcoming quiz night! Tuesday 4 August - Quiz Starts 7pm, but come early for dinner and when you purchase food a percentage goes back to our league! Email chchdeadendderby@gmail.com to secure your tickets or talk to a rollergirl, ref or official! Dead End Derby's All Star team face off against the Bay City Rollers on our home turf. No stilettos please at Cowles Stadium. Come join us to watch the Minions Movie at Hoyts Northlands. This fundraiser will help get DED (All Stars and LDR) to Whakatane for a double header against the WRDL. The Royal Rumble is key event in the Australasian roller derby calendar, and this year Dead End Derby's All Stars will be there! Who will be champion? Find out more HERE. The mighty LDR take on the Sirens of Smash in Nelson over Queen's Birthday weekend. Cash ticket sales only on the door, or buy them HERE. Bar and food available (EFTPOS at bar). BYO Cushion and warm jacket! The West Coast will be hosting a roller derby bout for the very first time this April 18th at the Greymouth Civic Centre. Come and watch our two teams, the Gold Diggers and the Coal Miners, made up of skaters from all over the South Island (including DED) come together and battle it out on the track. This is a cash only event and tickets will be sold at the door on the night. Drinks and nibble will be available for purchase. Doors open at 5pm. Dead End Derby Christchurch Rollergirls are proud to host our first inter-league bout for 2015, the best of Dead End Derby taking on Vagine Regime Aotearoa! Be wearing green to support our girls as they take on some of Vagine Regime at Cowles Stadium on Saturday 11th April 2015. Doors open at 6pm and first whistle is at 7pm. Tickets at the door on the night $15 adults, $5 children aged 5-12, $35 to bring the family (2A, up to 3 kids), preschoolers are free! Eftpos is available. Grab yourselves some cool DED merchandise, grab a drink at our licensed bar or some food from Mamacita's or All Thingz Nice. Entertainment for everyone including a kids table and lolly scramble! Air guitar competition at half-time where you could win yourself a cool prize!